Developmental surveillance in a school-age child should focus on identification of unsuspected learning problems, including attention-deficit/hyperactivity disorder (ADHD), mild mental retardation, and learning disabilities, as well as detection of emotional problems such as anxiety, depression, or school phobia. Emotional problems can be screened for using the Pediatric Symptom Checklist (PSC). The PSC is a one-page questionnaire that is relatively easy to administer and interpret during routine well-child care. Positive results should prompt the physician to probe further with questions regarding school, friends, family, moods, and activities. Referrals to other professionals can then be made if necessary. More information regarding the PSC is available on the Massachusetts General Hospital PSC website. Asking the child and parent about school progress and reviewing report cards and standardized testing results are simple ways for the physician to monitor school progress. Checklists completed by the parent and teacher can provide further information about specific issues (e.g., attention) or behavior in general (Table 23-12). Federal law (IDEA) mandates a free and appropriate education for all children, regardless of handicapping condition. Therefore, if a child is suspected to have a learning disability, the school is obligated to evaluate and provide necessary services, free of charge (AAP, 1999). The parent should be advised to request the evaluation, called the Multi-Factored Evaluation (MFE), in writing. Federal law requires the MFE be done within 60 days. The MFE consists of standardized assessments of various aspects of learning. Once the MFE is completed, school personnel meet with the parents to review testing results and determine if the child is eligible for special education services. These services may occur in the regular classroom or in a separate one, although the law requires that services be provided in the least restrictive environment. The goal is to keep children with their typical peers as much as possible. Once a child is deemed eligible for services, an individualized education plan (IEP) is developed. Parent input is required as part of the process. If the parent disagrees with the suggested IEP, the parent has the right to due process. An explanation of due process must be given to all parents at the beginning of the MFE/IEP process. Once developed, the IEP is updated annually. Parents should receive progress reports throughout the school year. They may request interim changes to the IEP if needed. Reevaluations are conducted at least every 3 years (Henderson, 2001). All this is often overwhelming for families. The physician can assist by providing simple explanations of the process as well as periodically reviewing the IEP and helping parents understand it. The physician should also encourage parents to become knowledgeable advocates for their child. 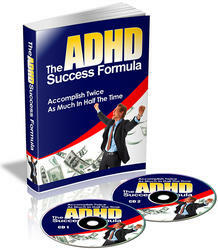 This is an audio and guide that will help you battle through ADHD and Accomplish Twice As Much In Half The Time. Learn more by download your very own copy today.